Although I've previously mentioned that I tend not to choose games for commentary from the super-GM class, the last batch I selected from 2016 all feature top names who happened to play brilliantly (and understandably) in my general opening repertoire, so I felt I couldn't ignore them! This next commentary game, from round 6 of the Tal Memorial tournament, features brilliant maneuvering from GM Levon Aronian in an English, which helps show the latent power of the central setup. There are some key thematic observations on positional topics, such as what happens with the light-squared bishop exchange on h3, but the focus of the game is on the queenside pressure and crush that Aronian builds up after his opponent (GM Anish Giri) allows him the initiative. In the resulting sequence, I think that most of the rest of us would decide on the option 21. Nxe5 (and not necessarily be wrong to do so), but Aronian's more complex 21. Na5 followed by an exchange sacrifice is a model of positional and tactical effectiveness. It is well worth breaking down the individual sequences of tactical ideas and how Aronian strings them all together with his final back-rank threats and winning knight maneuver. This Fritztrainer DVD by GM Nicholas Pert takes a trainer's approach to identifying and addressing typical Class player mistakes. Rather than focus primarily on teaching specific opening/middlegame/endgame knowledge (although there is an instructive chapter containing a couple of standard endgames), it looks at important concepts and practical decisions that improving players often get wrong. Based on his commentary, it seems that GM Pert reviewed a number of internationally-rated tournament games featuring 1600-1900 rated players and then organized the DVD chapters based on common themes he saw in them. Below are some of the highlights from my perspective. In each of the chapters there are opportunities for the user to do some of their own "find the best move" practice, either by pausing during the video presentations or with quiz positions after the main chapter material. As you'll see in the commentary, I found a number of common themes that have been previously highlighted in this blog. Naturally some of the example games provided on the DVD contain multiple themes and GM Pert points this out when it happens. Already there is a valuable observation here about the most practical approach to calculating and choosing variations. In the game example, a White knight is sacrificed on g7 and the Black player chooses a passive defensive line that is almost guaranteed to lose. The point is that any alternative to the chosen game continuation would be preferable, so Black should invest the time looking at critical lines (accepting the sacrifice) and other creative ways of countering it (one of which leads to an advantage). "Chess is a memoryless game" is a principle that many of us violate. We make a move and then realize it has problems, but then continue on with the idea anyway in order to try and recoup our investment. GM Pert shows how this is bad for our game. We need to have the mental toughness and lack of ego that will allow us to play what we (now) recognize is the best move on the board, even if it appears embarrassing - the chessboard does not lie, nor will it make fun of you for playing your best game. In some of the game examples, it's not clear if the player recognizes their mistake, or simply doesn't see a better plan. It's still instructive to see those types of situations illustrated, since they prod us to always keep looking for a better plan and not be locked into a single idea, if we have the time to think. I had a recent tournament game in which retreating a knight and admitting my previous idea was wrong would have saved a draw. I even recognized this intellectually, but instead tried too hard to justify my previous play; in part this was because I'd had a string of draws in the tournament and was frustrated with that. This was simply an emotional reaction, not wanting to experience the (false) embarrassment of retreating the piece and then deluding myself about my chances if I didn't. I went on to lose as my opponent's pawns crashed through my center, without the knight to support it, so ironically I got my wish of "not another draw" - but not in a good way. Accepting the truth of the chessboard is necessary for mastery, as is avoiding wishful thinking. Concept: it's not necessary to calculate out all variations to the end, but one must focus on the critical ones. This includes making sure that the opponent doesn't have any moves that refute the sacrifice, such as intermediate checks or captures. To make the sacrifice, you need to be able to assess that it gives you prospects for success (in other words that you "get something for it" that is real). Unsupported sacrifices clearly don't meet this criteria, as if the player has no other pieces able to attack, or if the defender can move his own pieces there first, there's no real attack. Sacrifices out of desperation often have no real prospects and just feel better (and lose quicker), rather than hard-headedly evaluating the needs of the position when careful defense is best. An excellent example from this blog of a failed sacrifice is Annotated Game #162. This is a particular weak point of mine, as I often pay more attention to my own ideas and not enough to my opponent's threats. The basic problem is focusing on one's own ideas, but not considering all of the opponent's possible moves. One antidote to this is to ask: why did they play their last move? (This is in fact part of my simplified thought process). Also, look beyond "obvious moves" to include possible captures and checks; sequencing of moves is also important. On the flip side, you should be alert and look for your opponent's weakening moves, especially moving away defenders of key squares; this commentary game featuring FM Alisa Melekhina is an excellent example. Common threats to look for: back rank or 7th rank penetrations; queen penetration into a position; taking advantage of hanging/vulnerable pieces (the "loose pieces drop off" idea). Highlights the need for careful evaluation of potential transformations of the position, especially when choosing to simplify down in material. This is a common problem among class players, for example in my simul game with GM Alex Yermolinsky. Short (too short in terms of content, I think, as this is a major failing of many Class players). Highlights understanding the consequences for your opponent's piece activity when seizing material, including the idea of subsequently giving back material to end up with a small advantage, while taking away your opponent's threats. Eye-opening about looking for lurking tactical issues (going back to previous chapter on your opponent's threats). Difficult-to-see tactics/moves are highlighted, including a bishop retreat / long-distance skewer example, along with in-between moves that gain tempo (i.e. with check). A personal issue of mine (as previously mentioned) is focusing too much on my own plans. In practical terms, this translates to focusing on only one board segment and not having full board vision. The counter to this would therefore seem to be deliberately expanding my the board vision. Practical decisionmaking (a theme with other sections as well): if your alternatives all look bad, calculate the most critical line fully to see if you have any real chances with it. Always calculate the critical line for opponent fully to ensure that it does not work. Test examples in this chapter included an "obvious" move being punished - see Annotated Game #149 for one of my own. This chapter could have included more guidance / suggestions on how to avoid mistakes (or at least improve your calculating ability). Class players typically do understand that bishops are better in open games; the DVD includes an example of a positional tactic swapping knight for bishop. One should also evaluate when knights are better (typically with closed pawn structures); this goes back to the idea of dynamic piece values. The importance of piece exchanges was looked at here as a mastery concept. GM Pert provides some interesting examples of how to work around annoying knights, rather than swapping good bishops for them, unless the swap is necessary to control key square(s). The chapter is not systematic in examining piece exchange ideas, but was helpful in flagging general considerations (and the need to fully evaluate piece swaps). Very short (2 videos plus test); no attempt to be comprehensive, just offering a couple practical examples. Opposite-colored bishops featured in one of the sample games, the point being that your pawns should control the squares of your opponent's bishop. Undermining your opponent's pawn structure/control of a particular color square complex was another theme, including with pawn sacrifices when necessary. The flip side of the previous idea is the concept of an advancing a pawn primarily to block others' advance, by placing it in the en passant capture position. Karlsbad pawn structure (d5-c6-b7-a7) vs. White minority attack: don't let White pawn get to b5 with the a-pawns on, advance a6 if necessary to guard b5. Also very short, but very much to the point. This is a key strategic and planning idea, especially when you have no other obvious plan (also included in my thinking process). Another aspect of this idea is to bring all pieces into an attack - look at the ones which are not playing and activate them, rather than over-using the ones that are already developed. Also avoid time-wasting moves in favor of developing moves, in general. Work out the best square for a piece, then maneuver it as necessary (including getting other pieces out of the way). This was included in a mastery concept - not every move has to "do something" in itself, it may just best facilitate the next move by a different piece, which is much more important. Exchanging pieces is the route to enhance king safety, especially the queens and when close to the endgame. Anticipate problems (weak squares around the king, etc.) and then look for defensive tactics. When on the offense, look to keep attacking pieces mobile and bring in additional pieces, while making sure your own king safety comes first (i.e. take away your opponent's threats). Example given of moving a piece out of the way (the king) in order to add another attacking piece (a rook) for a mate threat - as in previous chapter's theme. This is the flip side of chapter 3 (being unaware of opponent's threats); this time, the problem is that you give too much power to your opponent's threats and don't play the best moves as a result. If you have an advantage but can't see a complete path to a win, concentrate on making the best move in the position and keep on doing that; don't be deterred if your opponent gains back some ground, if you are still winning. Example was given of an unnecessary defensive sacrifice of a piece for a pawn. Maybe let a pawn go if you have to, but then shift to your own plan rather than giving all of the power in the position to your opponent and making it worse. Don't focus only on the one evident idea/threat of your opponent and overreact to it. Back to the original intro example, if you see only one bad alternative to your opponent's threat, it's a good practical decision to look for other, perhaps more riskier-looking options, rather than settle for a guaranteed poor position. The following game was widely considered to be one of Kramnik's best at the 2016 Olympiad; you can see the original ChessBase "Learning from Kramnik" article for analysis of this and several other illustrative games of his from the event. This particular game attracted my interest not just because of the quality, which was a standout in the Olympiad, but also because of the White structure Kramnik employs. Essentially he transitioned into a Leningrad Dutch style position, after Black opposed his Reti (1. Nf3) by using a Slav structure. I have aspirations of someday playing the Dutch (well) and currently play the Slav, so was able to take away some specific lessons in both cases. The apparent simplicity with which Kramnik maneuvers, his patient redeployment of pieces to best squares, and positional dominance with tactical themes (note the repeated pins and forks in the end sequence) are also all models for improving players to emulate. How many games to play per year? Are women underrated or overrated as compared to men? What does your chess tell about your personality? How does one prepare for an upcoming tournament? Is 1. e4 really "best by test"? The author has an entertaining writing style and deliberately chose the essay format (without a single chess diagram or variation given) to stand out from other books and, I would say, be more thought-provoking about the various topics. As a relatively successful amateur (currently rated a little over 2000 FIDE) who also manages (and is married to) WGM Natalia Pogonina, Zhdanov offers a different and sometimes unique perspective on his subjects, the majority of which have direct relevance for improving players. A couple of the most pointed essays have already been quoted from here, as Training quote of the day #9 and Training quote of the day #10. This is the type of book that can be enjoyed reading a few articles a day (my practice), or if you want to strictly do the one-a-day routine that also works. In part because themes regularly recur, with somewhat different angles or emphasis from the author, I do believe the collection of essays is best enjoyed, absorbed and pondered a few at a time. 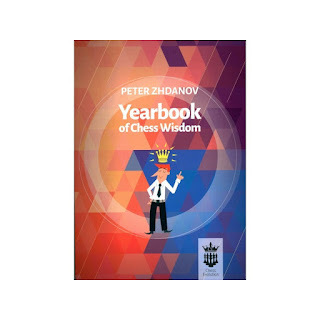 The book succeeds overall in making the reader think critically about a variety of different chess topics, while thoughtfully presenting its information, rather than trying to be a teaching manual. It therefore fills a unique niche for training and general enjoyment purposes.